My take: Phoenix Fuller grew up in the small town of Whiskey Creek, CA. Raised by a mother who was a hoarder, abandoned by her father and older brothers, she was an outcast at school. When she was befriended by Riley Stinson, her math tutor and classmate, she started to have hope for a normal life. They fell in love and were soon expecting a baby. As happens to many first loves, the two broke up. Riley started dating another girl while Phoenix felt her life going back to the way it was before Riley. Phoenix was involved in a car accident that resulted in the death of another classmate (Riley’s new girlfriend). Phoenix’s life changed at that moment and she went to prison for 17 years. Now released after serving her sentence she’s back in Whiskey Creek and hopes to form a relationship with her teen-aged son. The family and friends of the girl who was killed are determined to make Phoenix’s life miserable. If their daughter and sister can’t be alive, her alleged killer should not live a happy life, much less in the town where they live. Over the course of the Whiskey Creek series we’ve met several members of a tight-knit group of friends who’ve faced challenges of their own. They show a willingness to support their friend Riley in the way he’s always supported them. That was gratifying for me as a reader. I enjoyed THIS HEART OF MINE. I’d wondered about Phoenix each time she was mentioned in previous books. I wasn’t sure how Brenda Novak would present her when she figured into the series as a major character. I thought she wrote a wonderful portrayal of a character I hadn’t expected to like. 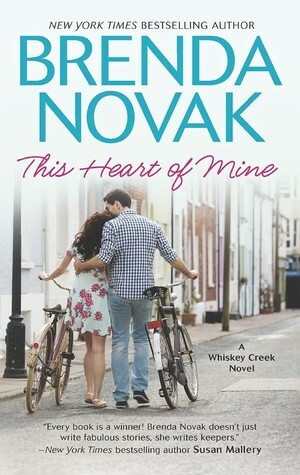 If you’re a fan of Brenda Novak and the Whiskey Creek series I think you’ll enjoy the newest addition to the series as much as I did. This one does sound good…I especially loved the mention of the character, Phoenix, growing up with a hoarder. I like stories featuring that particular compulsion, even if only incidentally. I wonder if the author connects Phoenix’s background with any of the choices she made? I like the sound of the setting of Whiskey Creek, too. Thanks for sharing. Yes, some of Phoenix’s choices are directly related to her situation at home (and the fact that she was a teen). Thanks for the comment, Laurel. Thanks for the great review of my newest book. I’m so happy you enjoyed the story! I think I have only read the first in this series, but this one sounds really good, I enjoy a read where a character has had to spend time in prison and then is out to re face life again. That sounds like a series I should look into. I’m with you; I didn’t expect to like Phoenix but in the end, actually long before the end of the book, she had won me over! I’m not a big series fan, but this sounds like a series I’d enjoy.